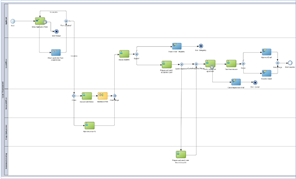 Oracle BPM Suite – a solution from Oracle for Enterprise Business Processes modeling with leveraging the BPMN 2.0 notation. Integrated development environment – JDeveloper is used for the modeling process. Oracle provides a special distributive of the solution for developers – Quick Start – which contains the Oracle WebLogic application server, BPM Suite, and JDeveloper. This article highlights how to download Oracle BPM Suite 12.2.1.2 Quick Start from the edelivery.oracle.com web-site, install that on a developer’s PC, create the first business process using JDeveloper, configure the integrated WebLogic domain (BPM Suite, SOA Suite, and Oracle Service Bus are included, and Apache Derby is here for database management), deploy the business process on this domain and start a test instance of the process. Read the complete article here.